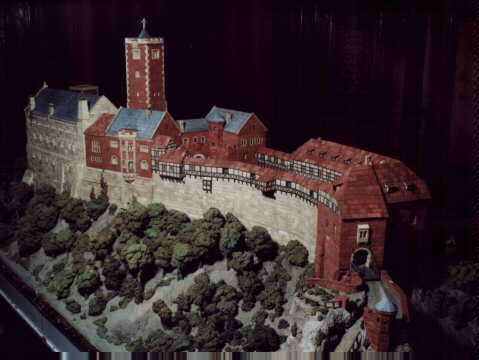 The large, Hans Ludwig model of the Wartburg has been moved from Berlin to the Richter villa in Rudolstadt. The picture on the left is my way of announcing that next month this web site will show many pictures of the Wartburg, and the restoration done by Leo Coffeng and Jan van der Werff. Everything else will be eliminated in March in order to make room for the Wartburg pictures. As you can see, the model is both large and very fine. The CVA Stone Catalog is available again! It seems that the earliest that the new, updated, Stone Catalog will be ready is September. So, more have been printed. Remember, the Stone Catalog is loose-leaf, so when the new revision is ready, you can add the revised pages. As before, $25, including postage, but without the loose-leaf binder, which is the European A4 size. The USA has been allocated only four catalogs. I will try to bring back more in April, if they are desired. The builder this month is Tim Fullam of Juneau, Alaska. He built a beautiful English church, based on an 1823 engraving of an abandoned ruin. My page shows my last building. It is not a special design, but a Richter design from the DS 27 book. I have build many DS designs, but never using the DS stones and metal roof parts. I just wanted to give it a try. Did I cheat? Take a look and find out. Over 600 different Anchor Stone Building Sets were produced in a number of different series. In addition Richter offered other "stone" products such as puzzles and laying games. Information on these building set series is provided here, but one can e-mail me on other Richter products. People who would like to know more about a specific set, including value, or are only interested in additional general information are urged to contact George Hardy (This page usually shows some of my buildings, but not this month.) by e-mail. All e-mail questions will be answered, to the extent of my knowledge. The CVA has published its Stone Catalog, which covers all of the stone shapes Richter made, plus shapes made by other innovators. Metal parts and most other accessories are included in the catalog. The contents of the sets are also listed. Because of popular demand and delay of the new edition, more catalogs have been printed, and four of them are en-route to me right now. I have brought two of them to the USA. These loose-leaf catalogs, pages only -- without hard covers, cost $25, postage included. All Anchor people need, and will want, a copy. In addition, seven standard CD-ROMs are now available. All of the scans are JPG files. # 1 contains the GK-NF building and layer plans, excluding # 34, plus advertisements; # 2 contains the DS and VEB building and layer plans plus information about the old factory; # 3 contains all packing plans, # 34 building and layer plans, and various additional items like figures, inserts; # 4 contains the building and layer plans for the second series of GK-Br and Imperator, the VE series and the all-metal Imperator; # 5 contains the KK building and layer plans, plus the factory information; # 6 contains the building and layer plans for the miscellaneous series (100, 200, 300, 400, A-B, Capital, Comet, Eagle, Orion, EF, GK-AF, LaVelle, Eisenbrücken); # 7 contains the building and layer plans for the NS, Special Sets, personal designs and the first series of GK-Br and Imperator. Members of the Club of Anchor Friends only can also obtain the six CD-ROMs containing all of the MLBs, including both the English and the German language translations. If you want to buy one or more of these CD-ROMs, please send $2 for the first CD-ROM and $1 each for all of the rest -- postage included, no matter where it is going (OK, excluding Mars). For the month of February, 2001.